100G OM4 LC LC Fiber Patch Cable | Duplex 50/125 Multimode Jumper | Length Options: 0.5-300M. 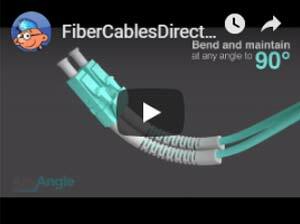 Assembled with ceramic ferrule LC duplex connectors and Corning 50/125um laser optimized multimode fiber core/cladding, 100Gbps rated fiber optic jumpers. A high performance cable wrapped in an aqua, zip-cord reinforced, 2.0mm o.d., flame retardant, water resistant and UV resistant jacket. 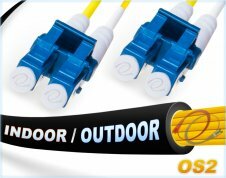 OM4 LC LC Fiber Patch Cable | 100Gb Duplex 50/125 Multimode Jumper Cord. Accelerate your network's performance to the edge of technology with this Corning 50/125um core/cladding, OM3/OM2 backwards compatible, laser optimized 10/40/100Gb multimode fiber cable and extend your 100Gig reach up to 150 meters. Assembled with OFNR riser rated, 2.0mm outer diameter, zip-cord reinforced, aqua pvc jacket that's flame retardant, water resistant, UV resistant and immune to electrical interference. Terminated with 1.25mm ceramic ferrule LC duplex type connectors and includes pre-installed LC duplex clips for quick installation and management in high density cable environments. Product is exactly what I needed. It got the job done getting another department in the building roped into the network. 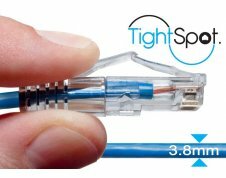 Great fiber patch cables at a great price.